The Ariane 5 is still the dominant player in the market for big commercial satellite launches, but this position is being challenged by a new wave of American offerings, in particular from the California SpaceX company. This US firm’s Falcon 9 rocket already undercuts the Ariane 5 on price and will get even cheaper if efforts to fly each vehicle multiple times prove successful. The contract amendment signed in Paris follows approval by key committees at Esa in the past few days. They signalled their contentment with the preliminary design progress on the Ariane 6 and the reorganisation in Europe’s rocket industry required to implement vehicle production. The last detail to be agreed was the establishment of a second line of fabrication for the carbon-fibre casings of the 6’s strap-on, solid-fuel boosters. This will be in Germany and will supplement the line already planned in Italy. Many boosters are required, not only for the 6 but to use as the first stage on an upgrade to a smaller rocket known as Vega. "Thanks to the trust and support of Esa and its member states' representatives, the industry has met its commitments and proved its ability to fulfil its role as a design and industrial authority," said Alain Charmeau, CEO of Airbus Safran Launchers. “We have met the deadlines and quality objectives set, and now, thanks to the industrial organisation rolled out in record time, we can continue to develop a flexible, modular and competitive launcher that will fly in 2020". 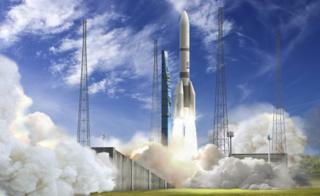 The Ariane 6 will come in two versions. One, known as Ariane 62, will loft medium-sized spacecraft into orbit - the kind of platforms that image and study the Earth. A second version, known as Ariane 64, will put up the heavy telecommunications spacecraft, which sit 36,000km above the equator. The new rocket leans heavily on its heritage. Indeed, its upper-stage engine, called Vinci, was originally intended for an upgrade of the Ariane 5. Prototype Vinci test firings were conducted through the summer. The Ariane 6 will fly from a dedicated launch pad at the Kourou spaceport in French Guiana. Jungle land has already been cleared for the facility, which is subject to separate contractual arrangements between Esa and the French space agency (CNES). Wednesday’s signing means there should be no arguments over the Ariane 6 when Europe’s research ministers meet for their big council gathering on 1/2 December in Lucerne, Switzerland. In recent years, these fora have been dominated by negotiations over funding, national participation and workshare. This time, the Council will confine itself to discussions about technology evolution programmes, such as the proposal to develop a liquid methane/oxygen engine dubbed Prometheus, which could one day power the Ariane 6’s core stage. Engineers believe this propulsion unit would be substantially cheaper to produce than the Vulcain engine that will drive the 6 skyward when it starts operating in four years’ time. Wednesday's contract amendments were signed at Esa HQ in Paris by the agency's director general, Jan Woerner, Mr Charmeau, and Jean-Yves Le Gall, the president of CNES. The signatures were inked in the presence of Thierry Mandon, French secretary of state for research and higher education.